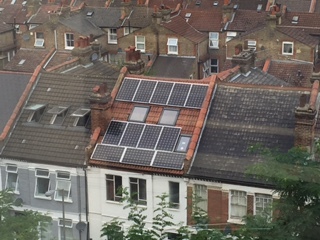 The increased use of Solar Panels is becoming more and more evident. A Structural Survey may be required to make sure that the added weight of the Solar Panels is not causing any damage to the roof structure or roof coverings. The photograph above was taken in Tooting, SW17. If you are looking for a Structural Survey or another property surveying service, do not hesitate to get in touch with us today. Call us on 01737 245947 or fill out the contact form on this page for a free quote. A member of our friendly team will be in touch with you as soon as possible.